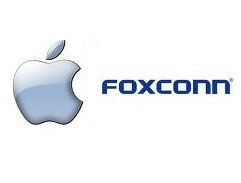 Foxconn have a harder time of it: Some say their too closely linked to Apple. You have probably heard of Hon Hai Precision Industry Co Ltd, although you'll probably know them as Foxconn instead. They're the guys responsible for a huge amount of your own and your family's tech. It seems that the guys at Foxconn have had a bit of a rough time of it lately and apparently their fortunes are very closely tied to those of Apple. Foxconn are thought to have somewhere between 60 and 70 percent of their revenue from building Apple's iPhones and iPads, but the guys from Taiwan have seen a 19 percent decline in sales in the first quarter of this year compared with the same period last year, something which Reuters explains by a 'disappointing demand for the iPhone'. An analyst from KGI Securities said that, "A quarterly decline was expected, but not a yearly decline... This shows that Hon Hai's revenue depends too much on Apple, and iPhone orders corrected more than expected." The same analyst said that Foxconn's profit is likely to be at risk in the first half of the year as things are expected to stay relatively flat through the next quarter too. What do you think? Is Apple going to be able to sell enough iPhones to keep Foxconn in the green or do you think they're sales are going to plateau from here on out?